Who sets up an international men’s day? Donald Pettitt (right) talks about his experience with the men’s day group. My day job is running a support service for men based in Christchurch. 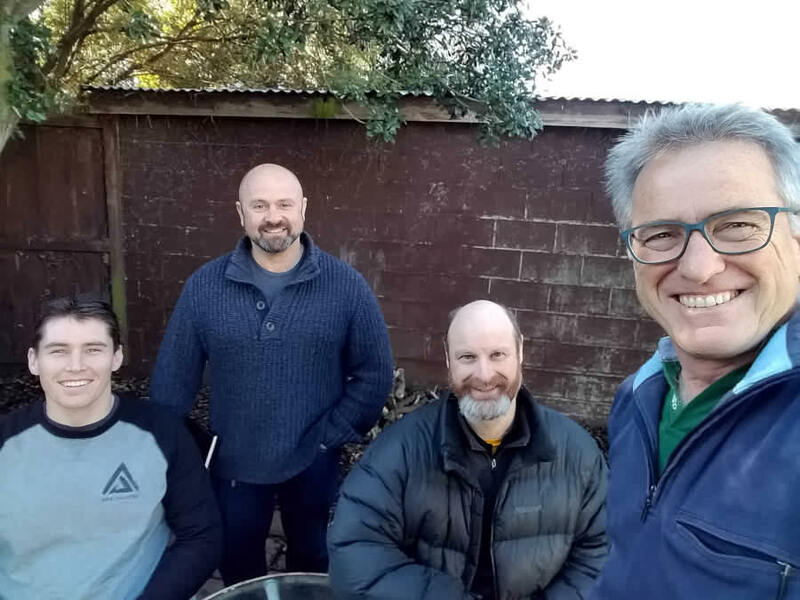 Our goal is Happy Healthy Canterbury Men and it involves a range of different projects. Occasionally I come across people that say they want to do something more for men and boys. They aren’t thinking individual change but larger social change to address the many challenges that men/boys face. Usually, I shrug and say “I want that too” pat them on the back and say be sure to sign up to our emails and I’ll keep an eye out for ways they can help. It’s such a daunting project taking on a culture, and living in an earthquake-prone city with a complex rebuild of my house has made this even harder to focus on more esoteric issues. This time a few people approached me around the same time and I thought I’d get them together and see what happened. That few have turned into a group of seven and right from the first meeting they got down to work with the key focus being International Men’s Day on 19th November. As I sipped my cup of tea during the first group meeting, the reality of what they are trying to do finally hit me. They don’t just want to have a cuppa on the day with an open invite to the community and a couple of pictures on Facebook. They want a campaign that has a national impact and they are acting like they mean it. It’s interesting for me to watch a group form and evolve. It’s all part of the community development I do in my day job. But I’m finding this project especially rewarding already and expect us to have much more significant outcomes than I’d ever considered. I hope I’m looking back in another few months and saying it was even bigger than I thought at this point. I look forward to making that further post. Here are a couple of events that we are not affiliated with, but look like they will be interesting. Hard-ly Speaking is an opportunity for every kind of man to gather together. Whether you’re beardy or baldy, Grandad or lad, get up at 4am to milk the cows, or stay up until 4am watching The Handmaid’s Tale, you’re invited to come and share your experiences. You’ll hear from six diverse men – sharing their successes, failures and feelings, touching on conversations that flip traditional ideas of masculinity and triggering forward-thinking ideas for our society. Some emotional buttons may be pushed – but we’ve got whisky for that. With the recent explosion of feminism, the #metoo movement and the emergence of the terms ‘toxic masculinity’ and ‘mansplaining’, it’s easy to see that being a man in 2018 is not as simple as it once was. Can we all benefit from men taking on so-called ‘feminine’ traits? Or should we just let boys be boys? Jarrod Gilbert (Patched) speaks to three writers – Dominic Hoey (Iceland), Omar Musa (Here Come the Dogs) and Chris Tse (He’s So Masc) – about depictions of masculinity in their work, growing up male, and what it means to be ‘manly as’. Dr. Jerome Teelucksingh is the founder of International Men’s Day. In this video, he talks about his view for unity and solidarity. Just after International Women’s Day this year TVNZ Breakfast host Jack Tame rightfully pointed out that people should be talking about International Men’s Day in November and not in March around International Women’s Day. Tame was frustrated that many commenters were asking about Men’s Day rather than focusing on women’s issues on Women’s Day. We are pleased to say that we will be raising awareness and talking about Men’s Day this November. Hopefully, people will become better informed and not have to ask about Men’s Day because they will already know all about it. International Men’s Day is on November 19th. We are currently in the planning stages and will post more information when events are finalised.